"King Wen" redirects here. For the ruler of Nanyue sometimes known by that name, see Zhao Mo. "The Cultured King of Zhou"
King Wen of Zhou (Chinese: 周文王; pinyin: Zhōu Wén Wáng; 1152 – 1056 BC) was king of Zhou during the late Shang dynasty in ancient China. Although it was his son Wu who conquered the Shang following the Battle of Muye, King Wen was honored as the founder of the Zhou dynasty. A large number of the hymns of the Classic of Poetry are praises to the legacy of King Wen. Some consider him the first epic hero of Chinese history. Born Ji Chang (姬昌), Wen was the son of Tai Ren and Ji Jili, the king of a small state along the Wei River in present-day Shaanxi. His father was betrayed and executed by the Shang king Wen Ding in the late 12th century BC. He married Tai Si and had at least ten sons. At one point, King Zhou of Shang, fearing Wen's growing power, imprisoned him in Youli (present-day Tangyin in Henan). However, many officials respected Wen for his honorable governance and they gave King Zhou so many gifts – including gold, horses, and women – that he released Wen, who subsequently planned to overthrow King Zhou but died before he could accomplish it. 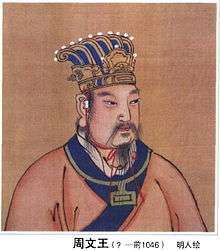 His second son, King Wu, followed his father's wishes and crushed the Shang at Muye, creating the imperial Zhou dynasty. A burial mound in Zhouling town, Xianyang, Shaanxi was once thought to be the final resting place of King Wen. In the Qing dynasty the tomb was fitted with a headstone bearing Wen's name and incorporated into a temple complex in his honor, which is still open to tourists. Nearby tombs were thought to be those of Wen's successors King Wu, King Cheng and King Kang. Modern archeology has since concluded that the five tombs are not old enough to be from the Zhou dynasty, and are more likely to be those of Han dynasty royals. The true location of King Wen's tomb is therefore unknown, although it is likely to be in the Xianyang-Xi'an area. Many of the older odes from the Classic of Poetry (Shijing 詩經) are hymns in praise of King Wen. King Wen is also credited with having stacked the eight trigrams in their various permutations to create the sixty-four hexagrams of the I Ching. He is also said to have written the judgments which are appended to each hexagram. The most commonly used sequence of the 64 hexagrams is attributed to him and is usually referred to as the King Wen sequence. In 196 BC, Han Gaozu gave King Wen the title "Greatest of All Kings". ↑ Creel. The Origins of Statecraft, p. 42. Wu, K. C. The Chinese Heritage. Crown Publishers (New York), 1982. ISBN 0-517-54475-X. Wikimedia Commons has media related to King Wen of Zhou.